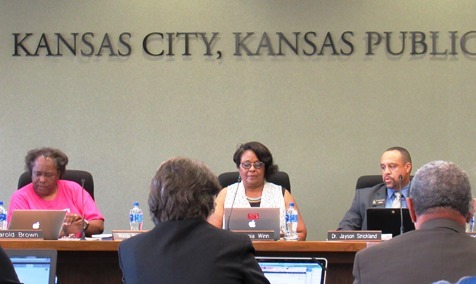 KCK school board advances budget with flat mill levy rate – Welcome to Wyandotte Daily! The first full meeting for Dr. Jayson Strickland in his role as acting superintendent was calm and short Tuesday. With no drama, a budget with a flat mill levy rate was advanced for the Kansas City, Kansas, Public Schools. During the meeting, Dr. Strickland congratulated Dr. Kelli Mather, chief operating officer, and her team for completing the budget. “I know that the budget work has been quite a task,” he said. The new budget includes funding for additional social workers for all the schools, a 2 percent raise for classified staff, an expansion at the Fairfax Learning Center and a 5 percent increase in health insurance costs. The mill levy under the proposed budget would stay the same as the past year at 49.39 mills, according to the budget document. Assessed valuation has increased this year in Wyandotte County, and revenues are anticipated to be up around 1 to 2 percent, according to Dr. Mather. The flat mill rate with an average increase in valuation means the average taxpayer may see a slight increase in taxes, although any actual increase would vary from one property to another, based on the individual property’s valuation increase. A public hearing on the budget will be held at 5 p.m. Tuesday, Aug. 14, at the district’s Central Office at 2010 N. 59th St., Kansas City, Kansas. The board voted unanimously, with no discussion, to advance the budget to the hearing. Keeping the mill levy flat was the biggest goal this year, according to Dr. Mather. This goal required the district to use more cash, she said. This year’s budget has an additional 31 social workers hired through district funding, she said, to serve all students. An additional 10 to 11 more mental health workers are through a pilot program with the state Department of Education, she added. The budget also funds an expansion at the Fairfax Learning Center, where 25 additional students will be served, she said. The district also faced a 5 percent increase in its health insurance costs this year, she said. Classified staff members are receiving a 2 percent pay increase under a measure already approved by the school board, while certified staff pay is currently under negotiation, she said. Dr. Mather said there was an increased cost to run the substitute teacher program this year. Also, the overall general fund was increased because funds were lost as a result of the audit, she said. Students are counted Sept. 20, and at the district’s most recent audit, fewer at risk and bilingual students were counted, she said. She added she was certain that the number of poverty and bilingual students did not decrease, but parents need to complete the paperwork for students’ free and reduced lunches to be counted. Despite the loss of funds from the audit numbers, the revenues are up about $4 million, she said, and there is $1.5 million for special education. The district is at the 30 percent cap for the local option budget, and the board has decided not to seek additional budget authority, she said. State education officials recommended that the district move $141,103 out of an old school retirement fund into the special education fund, she said. The district gets a little funding for this old school retirement fund, which has been obsolete about five years, from delinquent taxes that are paid. Total expenditures of all funds were listed at $445,228,849, an increase of about $42.3 million. The operating expenditures of the general fund were listed at $160,265,200, compared to last year’s $158,462,405. Expenditures of supplemental general funds, the local option budget under the operating funds, were listed at $51,314,913. The LOB rate of 13.533 mills is the same as last year. The Kansas City, Kansas, Public Library tax rate also is the same as last year, at 9.711 mills. The budget documents are online at the school district’s agenda at https://www.boarddocs.com/ks/kckps/Board.nsf/vpublic?open.